The failure to act to apply proven-effective policies to other tobacco products including cigars and e-cigarettes is directly responsible for the dramatic rise in youth e-cigarette use, and 27 percent of youth now use at least one tobacco product. This could set the stage for not only another generation of Americans addicted to tobacco products but ultimately more tobacco-caused death and disease. Nicotine is not only addictive but also harms adolescent brain development and places youth at risk for a host of other lung diseases related to this relatively new tobacco product. The association expressed major concern not only over e-cigarettes, vaping, and the slow regulatory action on them but also the perils posed by Big Tobacco involvement in the “epidemic” abuse of the devices and their catalyzing of liquids, laden with nicotine and other potentially harmful substances. As 2018 ended, Juul announced that it had cut a deal allowing a major tobacco company to buy in to its e-cigarette and vaping business. That same company also said it had just bought into a firm that sells and distributes legal marijuana. This growing health menace also has been complicated by issues with potential flavoring bans, as well as the persistent question as to whether e-cigarettes could benefit adults trying to quit tobacco smoking — a declining but still leading cause of Americans’ disease and death from several kinds of cancer, heart and lung illnesses, and more. The lung association, in its report, has prodded the FDA to move faster with its planned crackdown on flavored cigarettes, including menthols, arguing that this oversight also should be extended to flavored liquids that teens love and use (catalyze) when vaping with e-cigarettes. Banning flavorings in tobacco use and vaping would benefit Americans’ health, agreed medical scientists in an editorial in the New England Journal of Medicine (NEJM), a respected medical journal that also carried a study on e-cigarettes that received extensive media coverage. The study, a rigorous clinical trial conducted in Britain with more than 800 subjects, tested whether participants reduced their tobacco use and harm more — by using e-cigarettes or through well-known and traditional nicotine replacement programs with patches, gums, lozenges, and sprays. Neither method could be called a smash hit, with success rates of 18 percent among e-cigarette users and 9.9 percent among routine nicotine replacement plans. Still, given the choice between the two, the e-cigarette route seems to show more promise. That conclusion not only has received a lot of attention, but it may bolster a contention by Big Tobacco, and, yes, Gottlieb and the FDA about a potential importance for keeping e-cigarettes around or more, particularly for adults. Not so fast, warned the NEJM doctors and medical scientists. In a separate editorial, they underscored that not only is more study needed on e-cigarettes, they urged the public, lawmakers, and regulators to look with care about the journal’s latest published research results. That’s because of one of its key findings: Although e-cigarettes seemed a better way to reduce harmful nicotine exposure, the devices had an accompanying effect that might have been expected. Study participants wanted to keep using e-cigarettes: A year into the research and after, 80 percent of them still vaped, compared with 9 percent of those who stayed with nicotine replacement products. 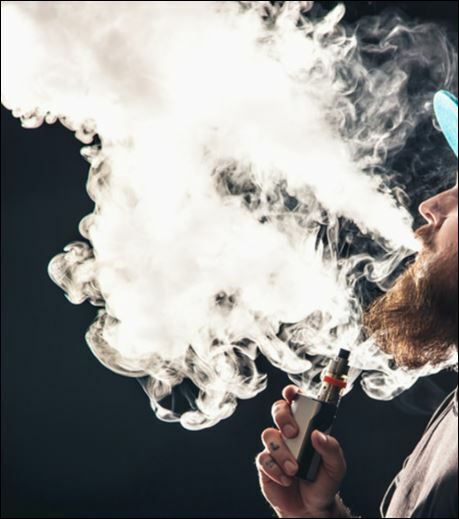 Vapers like the social and sensory aspects of e-cigarettes, rationales familiar to researchers who have studied how cigarette smokers get and stay hooked. Indeed, researchers at the nonprofit, nonpartisan, and independent RAND Corp. have published work that finds, especially among the young, strong association between e-cigarette use and exposure to subsequent smoking of tobacco in cigarettes. A new study in the Journal of the American Medical Association also reports that teens who experiment with e-cigarettes are more than four times as likely to try a tobacco cigarette and nearly three times as likely to continue smoking as those who have no prior tobacco use history. [E]-cigarettes represent a catalyst for cigarette initiation among youths. The association was especially pronounced in low-risk youths, raising concerns that e-cigarettes may renormalize smoking behaviors and erode decades of progress in reducing smoking among youths. This is unacceptable, and, as the lung association noted, the nation has made strides to lessen the damage that Big Tobacco and its allies inflict, with cigarette smoking falling to historic lows. The District of Columbia finally implemented its earlier-approved laws restricting tobacco sales to customers older than 21, and D.C. officials have imposed hefty new tobacco taxes that should reduce use. Although many other advances were made in the battle against tobacco and nicotine, still more must be done to create smoke-free environments, support anti-smoking prevention and treatment efforts, and to tax and regulate Big Tobacco, as well as vaping and e-cigarettes. With the merchants of death pushing their products always — tying into new ways and markets, including risky linkages with pot and its potential creation of greater problems in road safety — we can’t drag our feet nor rest.